I am a huge fan of science fiction movies. As a kid growing up in the 60’s I loved all of the “Monster” movies that were popular at that time. Some of my favorites were “Jason and the Argonauts” and “The Seven Voyages of Sinbad”. One of the best monsters in those movies was the Cyclops. This fierce one eyed beast has always been one of my favorites. So naturally the idea of doing a blog post about a Cyclops as it pertains to the watch business was a natural fit for me. Starting in 1954, the Rolex cyclops was added to the Rolex DateJusts making the date easier to read by magnifying it by 2.5 times. According to Rolex history, Hans Wilsdorf’s wife had difficulty reading the date on her watch. Subsequently, Hans Wilsdorf had the magnification cyclops added to the DateJust. Since its introduction in 1954, the Rolex cyclops window was added to both dress and professional watches. Rolex DateJusts, Presidents, SkyDwellers, all have the cyclops. Rolex professional models such as the Submariner, GMT, Explorer II, and the Yachtmasters have the cyclops as well. The only watches that do not possess the Cyclops are watches that do not have a date such as the Explorer I and AirKing. 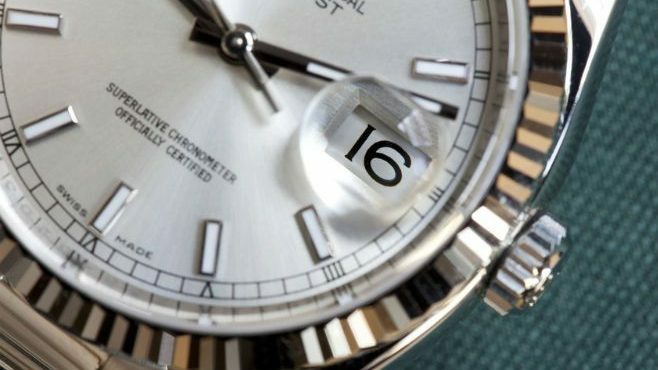 A cyclops lens on a thicker crystal would magnify too much because the top of the lens is farther away from the date wheel than on standard Rolex sapphire crystals. On older Rolex watches with acrylic crystals, the cyclops lens is molded and integral to the crystal as one piece. With newer sapphire crystals, the cyclops is actually a separate piece of sapphire glued to the crystal. What is amazing is that a Rolex cyclops on a Rolex sapphire crystal looks as one piece, but in fact they are two. 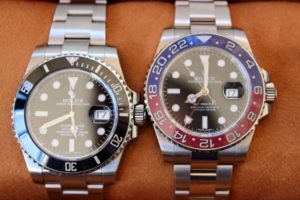 Other watch companies have included a cyclops on their sport models, namely Cartier, Seiko, as well as others but there is only one true cyclops lens and they are found only on Rolex watches. Magnifier lenses are not without their drawbacks. Many people do not like them for two reasons. First, is that they tend to attract scratches and blemishes. Being raised up from the otherwise flat crystal, the lens bump simply had more opportunity to rub against things. Second, lots of people simply do not like them from an aesthetic point of view. They can detract from the symmetry of a watch, and look odd while looking at the watch’s side profile. 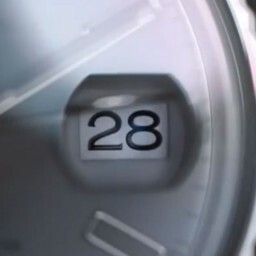 For someone like me with “aging eyes” the extra magnification is a big plus on any watch. Can you add a lens over a regular date window? They are getting hard for me to read, too. Thanks for another interesting blog entry. Just one exception, the Sea Dweller, date without magnifier. Thanks for the post. I did not know they were two pieces.Quit filling my brain with new stuff it is already full of stuff. Excellent post. One question. Is the reason many larger dial “sport diver” type watches don’t use the cyclops because they can get a way with a larger date wheel and thus, larger numbers for dates? These posts are great. Thanks Mark! I loved the same movies growing up. It was good to remember them just now. Great article, Mark! How do they attach the lens so that it looks like one piece, and not have the distortion from glue? I certainly appreciate mine as my eyes get older! One minor correction and deviation…The Rolex Sea Dweller 16600 does indeed have a date AND a flat crystal with no cyclops! Nice looking watch with a very good heritage. I have been considering this same model for quite a while. 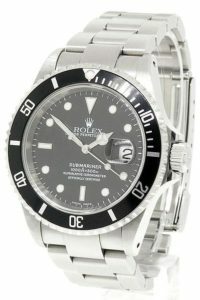 I have replicawatchespk.co.uk online several watch articles here that may help you buy a watch. day/date cyclops sapphire or glass, the long ones that will cover date and day ? If not where can I buy it ?